Professor Curtice is an eminent and respected academic, with a long honourable record of commenting on Scottish electoral matters. I am therefore astonished at his proposal for two questions in the independence referendum in 2014. 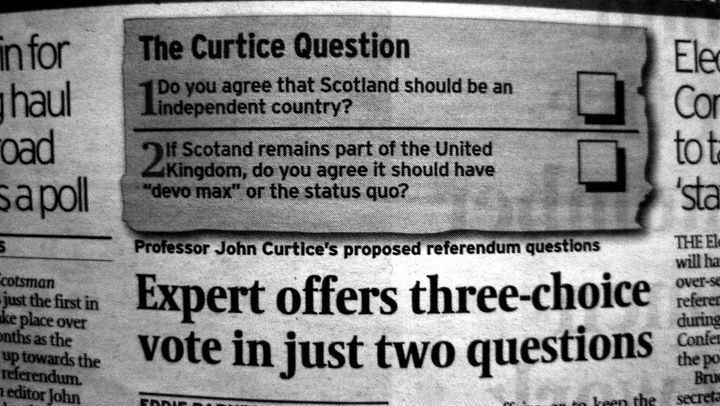 Assuming today’s Scotsman has reported him accurately in the little graphic (not shown in the online edition) at the head of Eddie Barnes’ article Expert offers three choice-vote in just two questions Professor Curtice has fallen into exactly the dangers and pitfalls of a two-question ballot paper that have been detailed by many, including myself at some length in previous blogs. Referendum ballot question - confusion? The first question – Do you agree that Scotland should be an independent country? – poses no problems. It envisages two possibilities only, and one answer only - YES or NO – gives a complete and unequivocal voter response. But the second question – If Scotland remains part of the United Kingdom, do you agree it should have “devo max” or the status quo? – has several weaknesses in construction. Since it is conditional on the answer to the first question, it assumes a NO answer to the first question. But by whom? The voter answering the question or the outcome of the total ballot? Since answering the second question is not prohibited by answering the first, a voter may answer both questions making either assumption. For example, a voter may legitimately answer YES to the first question and YES to the second, in other words, have a fallback choice. As a supporter of independence, that is exactly what I would do, and have the right to do, since my assumption is that if the YES vote fails, and Scotland remains a part of the UK, then I want devo max. My YES vote to the second question would then be aggregated with what could be a minority YES to the second question by those opposed to independence. While I am clearly happy with that, it is evident from the comments of those opposed to independence that they would not be, and confusing and contested outcomes could result. Of course, the Electoral Commission could rule that the second question will only be counted if a YES vote fails. But have they the right to make such an assumption and decision if in fact many voters quite reasonably completed the ballot on different assumptions? The second question itself is badly structured and worded. If I say YES to the question - If Scotland remains a part of the United Kingdom, do you agree it should have devo max or the status quo? - what am I saying YES or NO to? YES I agree it should have devo max or YES I agree it should have the status quo? If I say NO, am I saying NO I don’t it agree it should have devo max or NO I don’t agree it should have the status quo? In my view, the Electoral Commission should look critically at these questions and tell Professor Curtice to go back and think again. I gave Prof. Curtice the benefit of the doubt, thinking the Scotsman graphic might have been at fault. But I was wrong - list to John Curtuice state the question here.